Last Saturday I woke up with an unexpected yearning to go yarn shop hopping. I guess my resolve not to buy more yarn until I made a substantial dent in my stash had run its course and it was time to resume shopping. On weekends I move slowly, so there was only time to visit two of my local yarn shops. One of my purchases was a skein of gorgeous cotton variegated yarn called Pima Fresca from the Queensland Collection. I love the teal blue with the shades of brown, but I have to admit it looks better wound in a ball than it does knit up. I was hoping it would stripe nicely, but it was not to be. The mitt pattern is an improvisation that only took a few hours to knit on size 9 needles. 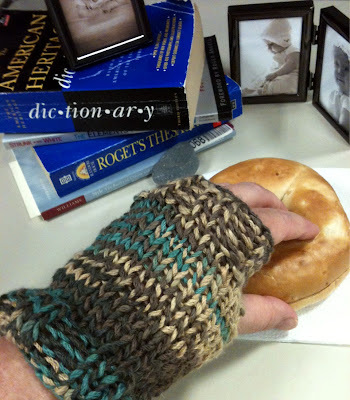 They are a bit loose and uneven, but the cotton feels warm and comforting, especially on my achy wrists. I didn't realize how chilly my hands get in my apartment at night until I put these babies on. 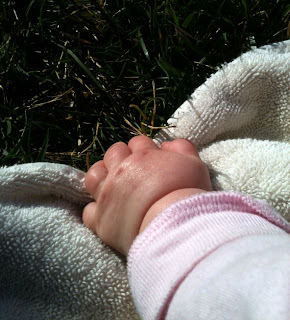 Speaking of babies, some day I will knit a pair for these little hands. I think they look very pretty Stacy! My hands have been cold too and I have been thinking of knitting a pair for me to wear. After seeing how nice yours look, it will have to move them to the top of my list! Sweet little hands:) Love the mitts! Have a blessed evening, HUGS! What a beautiful owl! Cool story. Fun "hand warmers"!!! Sweet little hand of your neice! I need to make a pair for my good friend and neighbor next week. Thank you for the inspiration. You are not alone in your need for a yarn hop. I'm planning a mini one for tomorrow because I'm starved for yarn. 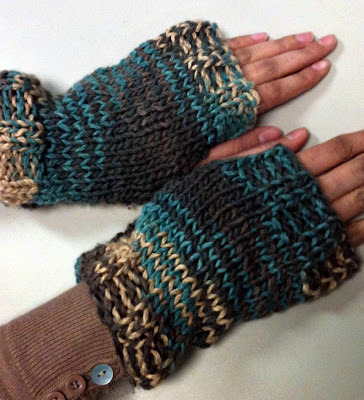 Your fingerless mitts look wonderful, they should be just the thing for the remaining chilly months.